Another December, another set of listicles. Every year for the the past six, I’ve rounded up the best edibles of each and posted them here for posterity. They’ve included a list of my twenty-five favorite dishes, the best dozen desserts, and the top ten restaurant meals of each year. This post covers the first of the three; the other two will come anon under separate covers (Updated: best desserts of 2011 is posted here). In 2008 and 2009, I expanded my list of twenty-five best dishes to include fifteen runners up. Last year, I trimmed back, returning to the original format, capping the list at twenty-five entries. My intentions to keep this list tight and taut again was overcome by the sheer volume of excellent food I’ve had this year. Unable and unwilling to let the many great things I’ve eaten in 2011 go unmentioned, I’ve reluctantly let it grow once more. So, in addition to the twenty-five best dishes of 2011, you’ll also find a second tier of twenty-five runners up (and a slideshow of all of fifty plates) on a page to which is linked at the bottom of this post. More than any other year, this year’s best dishes comprise a diverse group. Beast and bird, fish and foal, they all appear. In complexity, dishes range from cornbread in a skillet to a pig trotter, deboned and stuffed with forcemeat. In price, they run from 30 pesos (currently, about $2) to 98€ (currently, about $140), and beyond. There’s pasta and pastrami. There’s a tart, and tortillas too. Are grains the next pork belly? I hope so. Three of the top ten dishes this year are rice dishes, and nine of the fifty focus on a grain, be it quinoa or buckwheat. Two-thirds of the top twenty-five dishes are from restaurants outside the United States. This isn’t surprising. But three of the top five are from below the Mason-Dixon Line. I’ve said it in the past, and I must stay it again: preference is personal. And mind and mood cannot be altered. So, what you have here is nothing more than a very unscientific list of the best dishes as I received them, wherever and however I was at the time. File this list under opinion; it is neither authoritative nor comprehensive. Note also: this is not a list of the most delicious dishes I’ve had this year, although I would consider many, if not most, to be in that category. Quite a few of them earned their spot over others with thought and meaning more than taste alone. And, the numbers assigned to the dishes mean less and less the further you move away from the top, especially those first ten, which seemed to line themselves up in my mind and memory without help. With that in mind, from the thousands of plates I’ve had at over a hundred restaurants in over a dozen cities in eleven countries this year (you’ll find the complete list here), I give you the best dishes of 2011. I was lucky enough to have these twice this year. But it was those first ones I had in April – crunchy, shellacked with a sweet-tart glaze, and nestled in butter lettuce leaves with chow chow – that smote me something awful. “Redneck Chinese” is how Sean Brock described them, and I’ll certainly vouch for the accuracy of the second-half of that description, if he’ll be willing to vouch for the first. Handily, these crispy cups earned the top seat on this year’s list. At his little pub by the sea, Stephen Harris knocked my socks off with a perfect piece of skate, left on the bone, with the brine of cockles, the musk of sherry vinegar, and the fat of butter infused into its every seam. Brimming with the flavors of the coast of Kent, this was a soulful dish that I’ve dreamed about often since. Jeremiah Langhorne, the chef de cuisine at McCrady’s, made this rice dish at a cooking demonstration at the Music To Your Mouth Festival at Palmetto Bluff, and I was lucky to be there to taste it. It’s got history, but more so, it’s got butter. Carolina Gold, the grandpappy of American long-grained rices has got a beautiful, nutty fragrance, somewhere between jasmine and basmati. And cooked correctly, it’s tender and light, even when well-lubricated with fat. Served with a mini forest of herbs, this was comfort at its best. I was thrilled to see it on our menu at McCrady’s a few nights later. Bomba rice is short and round, pearly and meaty. 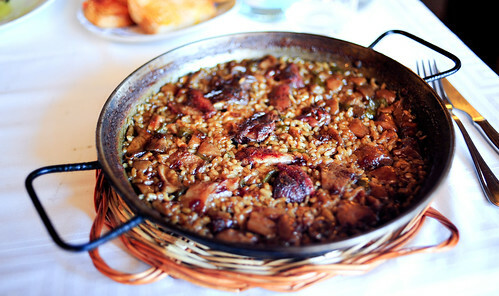 And the Spaniards along the Costa Brava do amazing things with it, like cook it along with chunks of pigeon and fleshy porcini in a paella pan in a wood-fired oven. The result is a burnished wonder, smokey and rich, the flavor of wood and earth. This dish, which I had inside a 17th-Century mill tucked among the hills of Catalonia, not far from the French border, was unforgettable. I don’t know how they kept these long, opaque strands of cuttlefish so tender, but they were almost impossibly so. These “noodles,” tossed with toasted pumpkin seeds, were served warm with a light wine sauce and brightened by a kiss of lime and creamy dabs of avocado. It was an unexpected, but amazing combination of textures and flavors. I doubted for years that Katz’s pastrami could live up to its legend. Well, it surpassed it when I finally made it to the cranky deli on the Lower East Side for a sandwich. The meat was unbelievably moist and soft. And there was something about its warmth, with the bite of mustard between those two slices of rye bread, that was comforting and nostalgic, temporarily lending me a childhood I never had. That’s powerful food. Swede is what the Brits call rutabaga, that unjustly maligned root vegetable, which here, was thinly sliced and baked with butter until it turned into a caramelized block of vegetable umami, rich and full, steadying and strong. I imagine that it’s a variation on the Turnip Bake on page 151 of Fergus Henderson’s “The Whole Beast” cookbook. I should make it. I can still hear my friend Belinda Chang effusing over the incredible collection of Rieslings she had poured to pair with our second courses at The Modern, which included this amazing little tart of tang. 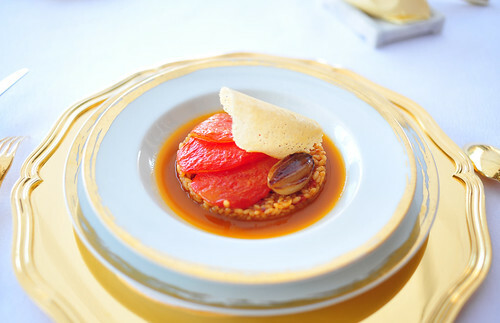 Alsatian flavors in new and exciting forms; this is the adaptive genius of chef Gabriel Kreuther. In this flaky pastry cup commingled sauerkraut and smoked sturgeon, all of which was buried under a frothy “mousseline,” whose creamy body, studded with caviar, was cut by a high, acidic line. 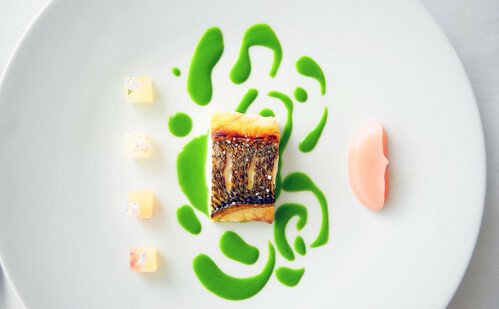 Pêche, sauce vert des herbes et citron vert, verveine. Michael Tusk’s pastas are unspeakably good, and this one was no exception. Casconcelli – those candy wrapper stuffed pastas from Lombardy – arrived pregnant with creamy ricotta and dressed with nothing more than melted butter and a drizzle of honey. The pasta was very delicate, and the flavors lovely – a milky sweetness hit with subtle, spicy heat. If I hadn’t already ordered other pastas, I would have had another round. Three little green pillows. That’s all that arrived on this plate, which turned out to be the surprise of the evening at Paolo Lopriore’s already unpredictable Il Canto. 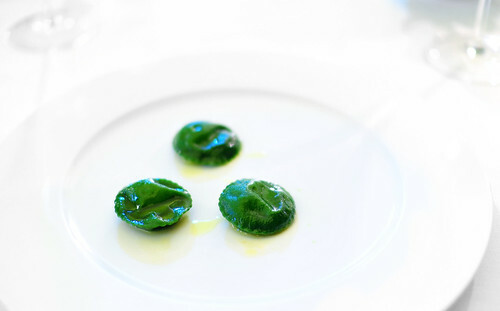 These discs were filled with a bracingly bitter chicory filling, more liquid than solid, more vegetal than earthy. The surprise: one of the three was spiked with a dark vinegar – it tasted like Chinese black vinegar – which brought everything, magically, into balance. This yeasty bun, filled with an oozing heart of one of my favorite cheeses – St. Felicien – is the best hot pocket I’ve ever had, and by far, my favorite of the eighty-some courses I had over at elBulli this year. Whatever wizardry that may have gone into making this “blini” completely passed me by, as it left me blinded on the roadside by its sheer deliciousness. I underestimated this polenta when it arrived, piled on a wooden disc, at our table at a little grotto restaurant in the Italian Alps. What looked like a stiff clump turned out to be an amazing crossroad of texture and flavor. A far cry from the smooth, toothless polenta I commonly find in restaurants, this one had grit and body, yet was creamy and soft all at once. The best part was the almost meaty, wood-fire smoke infused throughout. I couldn’t stop eating it. I returned a few months later, just to have it again. Surrounded by a swirling mass of entropy inside the covered market in San Pedro Cholula is Cemitas Lupita, a little stand that makes an amazing version of the famous poblano sandwich after which it is named. The cemita milanesa is a Mexican version of the pork tenderloin sandwich, except it uses a breaded veal cutlet instead. The meat is tender, thin, and so oversized that it spills out of the hubcap bun on all sides. It’s piled thick and high with quesillo – a ropey string cheese that the cemita-maker, invariably a stout, Mexican woman, will pull, fresh, into strands as fine as angel hair – avocado, onion, pápalo – think lovechild of cilantro and basil – and your choice of either rajas (pickled vegetables) or chipotle (I preferred the sweetness of the chipotle with the rest of the ingredients to the tartness of the pickles). What seems like a rather short list of ingredients makes quite a sophisticated sandwich, in flavor and texture. Like much of Mexican food, the cemita is extremely regional – you’ll only fine them in and around Puebla. Go. 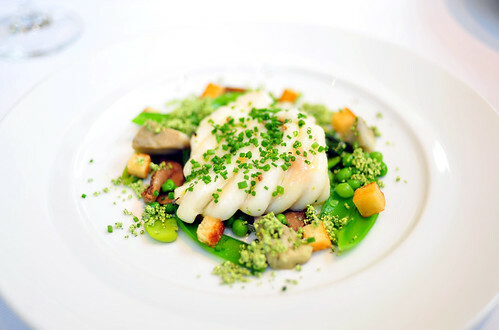 To see the twenty-five “rest of the best” dishes of 2011, CLICK HERE. ~ by ulterior epicure on December 16, 2011. Nice list – and Blackbird’s Sepia noodles have been sublime for a while. Quick correction: “12. Soft-Shell Crab (Husk; San Francisco, California)” — Wrong city. It was fun to have shared a few of these with you! Nice list! Glad that you finally got to Katz. I’ve been eating that pastrami since 1963, and it has not lost its impact on me. I dream of it now and then, and allow myself to eat it once or twice a year. uhockey: I haven’t been to blackbird in five years, so the sepia noodles were new to me. Thanks for the edit note; all fixed! docsconz: Indeed. May we have more great food together in the years to come. Joel: You New Yorkers are so lucky to have such easy access to such great food. Sad to see that Zaragoza’s birria did not rank. Which dish has young horse in it? @MBelle: Look at No. 49 on the second page. Shaved avocado pit? I’m so interested! How was this plated? @teamom: The “skin” of the avocado was pared off and the creamy flesh of the pit was shaved with a microplane zester over the avocado wedge in the bowl.